Synopsis: The town’s most hard-boiled citizens cross paths with some of its more reviled inhabitants. 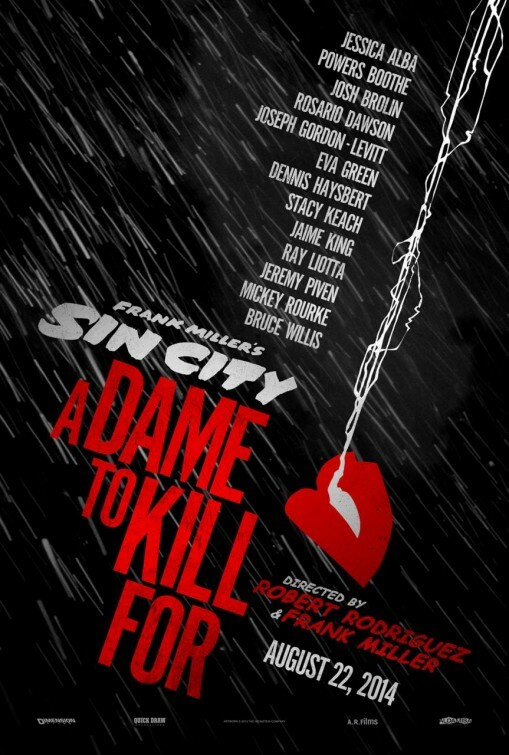 Thoughts: Not exactly striking while the iron was hot, this sequel to 2005’s technically sound but pretty darn moody Sin City finally makes it to the big screen after almost a decade of false starts and other production delays. Again directed by Robert Rodriguez and graphic novelist Frank Miller (also at the pen for 300 and 300: Rise of an Empire) this looks to have the same dark flash as its predecessor while introducing a new roster of shady characters like Joseph Gordon-Levitt (Don Jon), Eva Green (Cracks, Dark Shadows), and Josh Brolin (Oldboy, Labor Day) along with returning stars Bruce Willis (Color of Night), Mickey Rourke (Iron Man 2), and Jessica Alba. The first film broke new ground with its visuals…but it’s 10 years later and what was one revolutionary is now standard. What more does this film have to offer…and will it be too little, too late? Synopsis: Retired C.I.A. agent Frank Moses reunites his unlikely team of elite operatives for a global quest to track down a missing portable nuclear device. Review: Merriam-Webster defines goofy as “being crazy, ridiculous, or mildly ludicrous” and also defines silly as “exhibiting or indicative of a lack of common sense or sound judgment”. Based on a popular graphic novel from DC Comics, 2010’s original Red was a film of goofy fun that was a surprise sleeper hit at the box office thanks in no small part to its game cast willing to poke fun at their gradual over-the-hill-ness. Unfortunately, the sequel falls into the silly category with the gang reassembled for a movie that feels constructed for a quick buck. 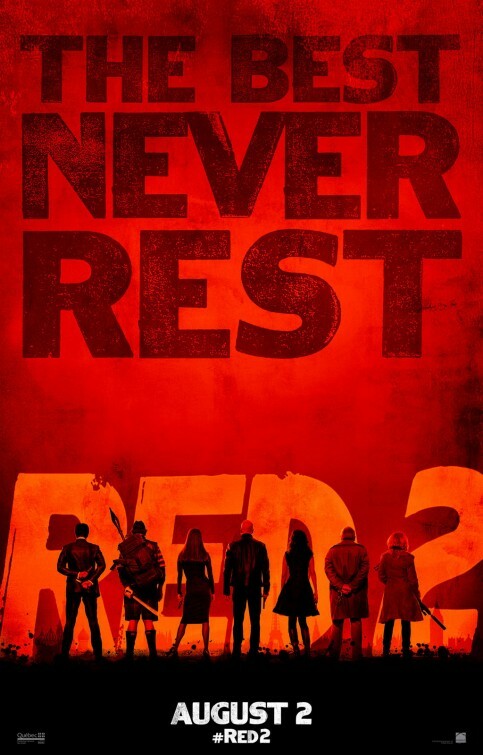 Red 2 throws the audience right back into the middle of the lives of Frank (Bruce Willis, Looper, Moonrise Kingdom), Marvin (John Malkovich, Warm Bodies), and Victoria (Helen Mirren, The Door, Monsters University)…all supposedly classified as Retired and Extremely Dangerous (RED). It’s hard to put the gun down though so all three still get in on the occasional action, though Frank is more focused on shopping at Costco with his quirky love Sarah (Mary-Louise Parker) than playing international spy. Willis is a curious actor that seems to appear in no less than twenty films a year, many of them instantly forgettable. Still, I enjoy the fact that he seems to realize where he sits on the Hollywood food chain and happily takes the money from the work he gets. As always, Malkovich keeps things interesting while Parker instills her character with perhaps one too many layers, effectively short-sheeting herself. You can almost hear Mirren’s eyes rolling throughout the film, yet she comes out largely unscathed thanks to the actress tackling the material and forcing it into submission. As is the case with most sequels, this one gathers some new folks to replace those that didn’t survive the first film and that’s where the movie starts its rapid swerve off course. Korean assassin Han Cho Bai (sleepy looking Byung-hun Lee, so much more effective in the nightmare-inducing I Saw the Devil) has some beef with Frank and a running gag of Frank stealing Han’s private plane has little mileage. Neal McDonough’s American assassin is so perfunctory it almost seems like he was filming scenes for another movie. While Anthony Hopkins (Hitchcock) is an interesting choice for the role of a looped-out scientist, the script by returning screenwriters Jon and Eric Hoeber never gives the award-winning actor much room to breathe and the result is a stifled performance. Then there’s Catherine Zeta-Jones (Rock of Ages, Side Effects) as a Russian with the most pronounced Welsh-accent in film history. I thought several times that Zeta-Jones might just make a meal out of the kitten-esque spy role but she’s treated so poorly by the script that she becomes yet another casualty of uninspired creativity. In the end, the most dramatic thing about her is her bangs. Instead of the tongue and cheek approach Robert Schwentke brought to the original, director Dean Parisot instead takes to sticking his tongue out at the audience who paid money to see this overly jokey film that takes shameless product placements to new levels. It simply never finds its footing and has too many holes and passages that can’t be taken seriously. The action sequences are devoid of any excitement and its PG-13 rating means that while lots of guns get fired and bombs explode there is nary a speck of blood in the entire film. I’m not advocating for splatter sprayed all around just for the hell of it but the film was clearly trimmed of any/all serious violence to stay within its rating. Red 2 is the most disappointing kind of sequel – one that tries to outdo the first without tipping its hat to any of the elements that made the original so appealing. It’s a lazy and cheap looking film that might make for a decent rental down the road on a day you’re home sick from work. That way, you can fall asleep in your own bed rather than in a movie theater and not feel quite as guilty. Skip it. Synopsis: Frank Moses and his motley crew of retired assassins return for a second outing. Thoughts: In 2010, RED was an unexpected fall hit, propelling a sequel forward with much of the original cast in tow. The nicely constructed first film was an oddball mix of action, comedy, and violence that played into the strengths of people like Bruce Willis while letting a star of Helen Mirren’s ilk go guns ‘a blazin’. 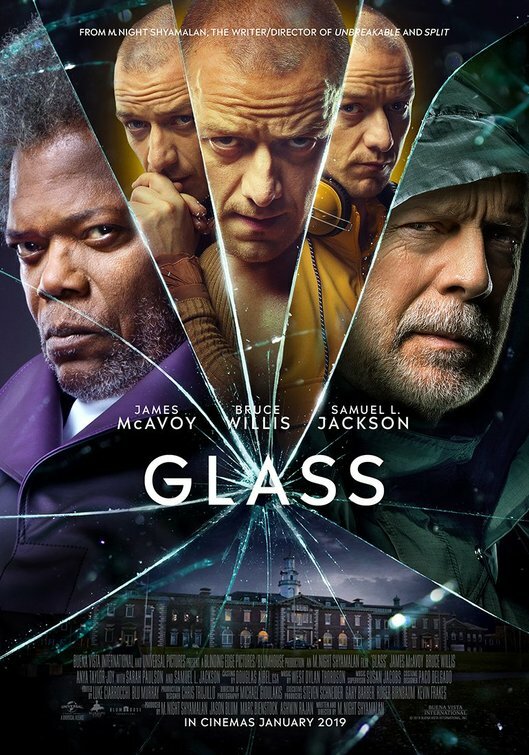 The sequel looks to be more of the same and in true Oceans 11 fashion more big names have been added to the list like Oscar winners Catherine Zeta-Jones and Anthony Hopkins. With new director Dean Parisot (taking over for Robert Schwentke who had his hands full with R.I.P.D) I’m hoping the same light touch is maintained, making this second film the first of several sequels. Thoughts: Arriving 9 months after its original release date of June 29 2012, this sequel to 2009’s brain dead but blockbuster G.I. Joe: The Rise of Cobra has released a new-ish trailer as it revs up to its late March release date. The official reason for the move was that Paramount Pictures wanted to add 3D effects to the film (a tip…any movie converted to 3D is usually a total waste)…but the real reason turned out to be that the move allowed new scenes to be shot that kept Channing Tatum alive past the first 1/3 of the film. With Tatum’s star taking off in a major way in 2012 (The Vow, 21 Jump Street, Magic Mike all being huge box office hits), this change of course makes sense. I still think the film looks like something that would have been released in the mid 90’s but I’m hoping it’s not quite as insipid as its predecessor. 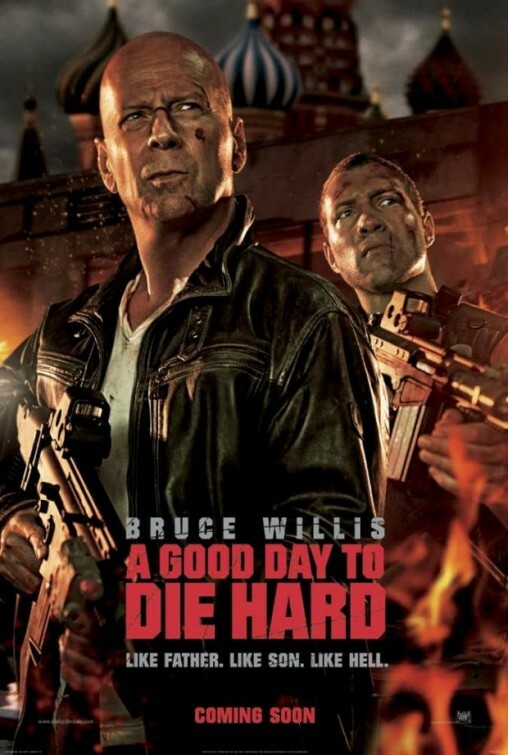 Synopsis: John McClane travels to Russia to help out his seemingly wayward son, Jack, only to discover that Jack is a CIA operative working to prevent a nuclear-weapons heist, causing the father and son to team up against underworld forces. Thoughts: There’s still some life left in John McClane as we approach the Valentine’s Day release of A Good Day to Die Hard, the fifth entry in the series. Though the look of this film feels light years away from the rugged 1988 original, I’m happy to welcome back Mr. McClane as he teams up with his son (Jai Courtney, impressive in Jack Reacher) to battle the Russians over, what else, nuclear weapons. 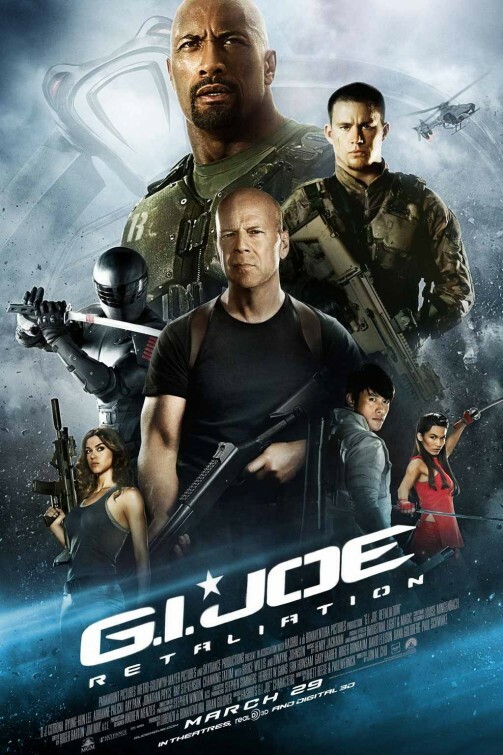 The previous entry in 2007 had some incredibly entertaining action sequences and this film looks to outdo its predecessor in the stunt work department…much to my delight. There’s a fine line these films have always walked between action and comedy but the great equalizer has always been Bruce Willis with his easy-going delivery that he can back-up with a punch. Still…am I wrong in wishing that Bonnie Bedelia would make a cameo in this as McClane’s wife? 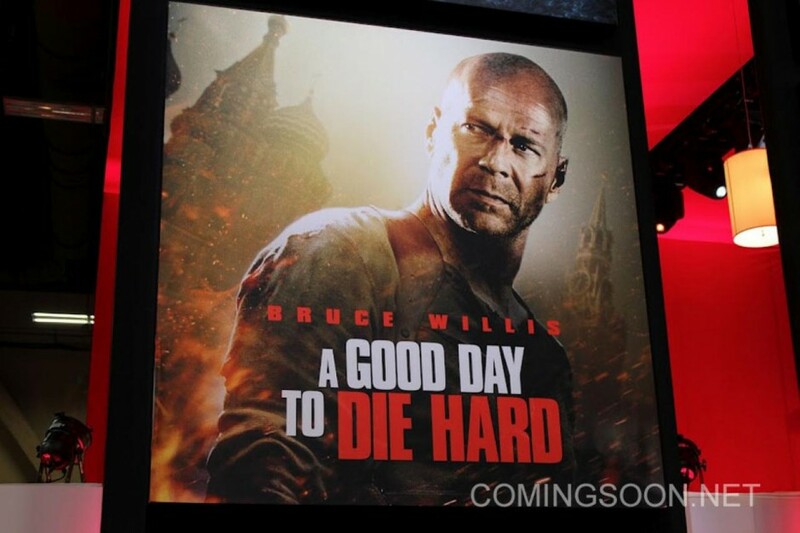 Synopsis: John McClane and his son take on local forces in Russia. Thoughts: Yes, yes, and more yes. I’ve always found the Die Hard series to be an enjoyable combination of action and a prime showcase for the wry humor of Bruce Willis. When the last sequel re-energized the franchise, talk quickly went to a fifth entry and now it’s gearing up for release in early 2013. This trim teaser shows us that McClane is back and this time he’s bringing his son. If all involved can capture the same magic that has propelled the other films to success we may be seeing McClane yippie-ki-yay-ing for years to come. Synopsis: In 2072, when the mob wants to get rid of someone, the target is sent 30 years into the past, where a hired gun awaits. Someone like Joe, who one day learns the mob wants to ‘close the loop’ by transporting back Joe’s future self. Review: Lately, whenever a movie arrives with huge buzz I’ve found myself more resistant to believe only because the hype machine can be ramped up for pretty much anything. With the internet growing and word-of-mouth advertising becoming a thing of the past, it’s easy for studios to plant some seeds of hype around the web to gain traction for their film. That way when opening weekend arrives, audiences are more likely to go with what they hear rather than what they read. In the case of Looper, the buzz has been growing steadily since the film was first screened. I approached the film with some hesitation only because there are several elements that I wasn’t sold on. The first was director Johnson who directed the overhyped Brick (which, admittedly, I never made it all the way through after several attempts) and the second was wariness for revisionist sci-fi. So when early reviews were good, I didn’t fully believe it. When major critics began giving it thumbs up, I didn’t fully believe it. Well, now that I’ve seen it…I fully believe. One of the better films (entertainment-wise) to be released in 2012, Looper is the kind of movie that should make you want to go to more movies. It’s clever, funny, unconventional, and an absolute blast to let wash over you. 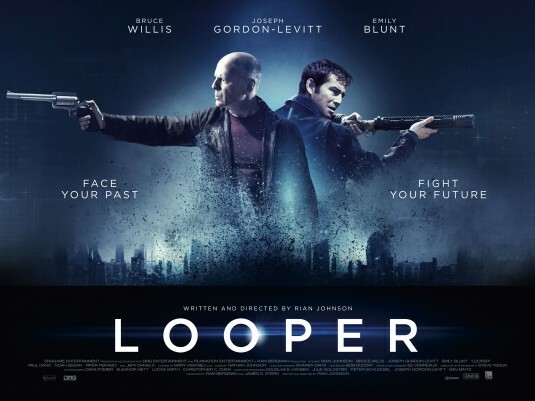 Unlike similarly enjoyable movies that you can experience and leave behind, Looper stays in your brain for some time after and keeps working on you throughout the rest of your day/night. It’s not a deceptive film that you’ll need to watch over again to fully appreciate it (like Inception, another Gordon-Levitt film) nor is it a film you’ll WANT to watch only once. The key to its success is a willingness to try something different – not a totally unique quality in film these days but one that rarely leads to the rewards Looper offers. There are concepts at work that couldn’t be pulled off by the uninspired or relayed by a group of people that don’t love the medium of film. Starting with a bang (literally) the film is in a state of constant motion which keeps it several steps ahead of its audience along the way. Instead of getting so far ahead that we can’t catch up, Looper leaves breadcrumbs in its wake to keep you moving forward without getting lost. You do have to pay attention to see the nuances of the time travel storyline but it’s in these details that the film is most impressive. Non-linear storytelling seems to be making a comeback in film and TV (heck, even Gordon-Levitt’s Premium Rush benefited from this angle) and in Looper the jumping around to different times nearly always makes perfect sense. After the film was over I sat with my movie mate and discussed the various jumps the movie makes and what that meant to its overall impact. If you dig deep there may be a few, um, loopholes that become evident but you’ll have to make a strong case to me for why they detract from the overall thrust of the movie. With Looper, director/screenwriter Johnson finally proved to me why he is a director on the rise. As previously stated, I found his Brick to be interminable…so much so that I skipped his next film The Brothers Bloom. There’s a sophistication to this work not present in his previous films and the film community is a better place because of it. Johnson , cinematographer Steve Yedlin, and production designer Ed Verreaux have collaborated on an sharp looking, well fashioned film that looks exactly like it should. Like Robot & Frank, their vision of the future is less about flying cars and aliens and more about plausibly advancing our technology to several decades from now. After The Dark Knight Rises and Premium Rush, Gordon-Levitt scores another win in 2012 (and he’s not done yet…he plays Lincoln’s son in Spielberg’s upcoming Lincoln) with a role he clearly put a lot of work into. Playing a young version of Willis, I didn’t always see the connection between the two…but it matches enough in the mannerisms and speech that it begins to make sense. Gordon-Levitt has the tougher job than Willis in the impression department but Willis also shines in a role tailor-made for his talents. Blunt makes a total detour from the characters she’s played previously to deliver another on-the-money performance as a ballsy single mom. Playing her son, Gagnon is a real find…equal parts precocious and mysterious as his involvement in the future is revealed. It’s heady stuff for a kid to play and Gagnon is more than up for the challenge even at his young age. Daniels makes less of an impact as crime boss…but maybe it’s because he looks like he just woke up for many of his scenes. The one thing I’ll say in the negative category is that the movie felt longer than it was. Two hours is still a long film but there were times when its eyes may have been bigger than its content and it overreached a tad too far. Still…that’s a problem with the editing not with the full picture. Violent at times and violently funny at others, Looper is a nicely executed cinematic meeting of the minds that delivered full force entertainment for your hard earned cash. I went in expecting to be entertained but left entertained and inspired. With a tiny trim to tighten up the running time, this could be one of those films that we look back on as the beginning of a new movement in the sci-fi genre. Review: It would be easy to dismiss The Expendables 2 as brainless fodder for men that wore out their VHS copies of Bloodsport, Cobra, Commando, and countless other action films of the 80’s. Actually, that’s the very reason it should be embraced. It’s big, loud, and kinda dumb looking – much like most of aged punch-‘em-up heroes that populate the cast – and it’s not all that bad. Well yeah, it’s bad but in the same way that Velveeta is bad…meaning it’s oh so good. I wasn’t the biggest fan of 2010’s The Expendables, thinking it to be a poorly made and overly hyped trash fest that was beneath even the likes of Stallone. The film was too dark and bet the bank and lost on its one gimmick of bringing together a pile of familiar faded faces. Stallone wrote and directed the first one which I think was another mistake…because it seems the man can’t multitask. Thankfully, for the sequel Stallone settled for just co-writing and starring in it and that allows the film to breathe a bit more and favor some of the ensemble members. Director West (Con Air) knows his way around a film like this and easily navigates his cast around. No one in the film is known for their serious acting so it’s just a lot of scene chewing and men with guns doing their thing. Crews, Lundgren, Couture, and Li are all second bananas to the likes of Stallone and Statham who have perfected their blithe back-and-forth banter. Willis and Schwarzenegger popped up as cameos in the first film and their roles have been beefed up here. Schwarzenegger has more time on his hands now that he isn’t running California and Willis needs to fill in his quota of appearing in at least ten films a year. Some nice callbacks to previous films they’ve starred in is pleasant but does zap your mind back to these better films one time too often. Norris shows up for a glorified cameo and takes a few nice potshots at his fanbase, demonstrating that the onetime Walker Texas Ranger has a good sense of humor. Much has been made about Van Damme’s villainous role (not the least bit ironically named Villain – Vill-Ane) but he too shows up for precious little screen time. Van Damme gets a few round off kicks in before going mano-a-mano with Stallone for a fight that’s more enjoyable than it should be. The lone female presence is from Chinese action star Yu who isn’t given much to do. I kept waiting for her to have a special talent or do something of interest but she’s tough-girl eye candy for the men until the film tries to awkwardly shoehorn in a romance between her character and Stallone’s. Like the original film, trying to instill a romance for Stallone seems incredibly phony and has zilch to do with the plot. It’s actually good that Yu is here because the testosterone level is so high that even a soprano might leave the film singing bass. Ah…to the plot. It’s your general mash-up of nuclear weapons and machine guns and many, many killings by automatic weapons. In fact, the movie achieves its R rating for its violence alone…there’s not a single F-bomb that I can recall and the language is mostly in the PG-13 category. I had read that the film was shooting for a PG-13 (on the wishes of Norris!) but finally added more blood and gore to take advantage of an R. The bloodshed is pretty comic and looks totally CGI-ed after the fact…like a big screen version of Street Fighter. 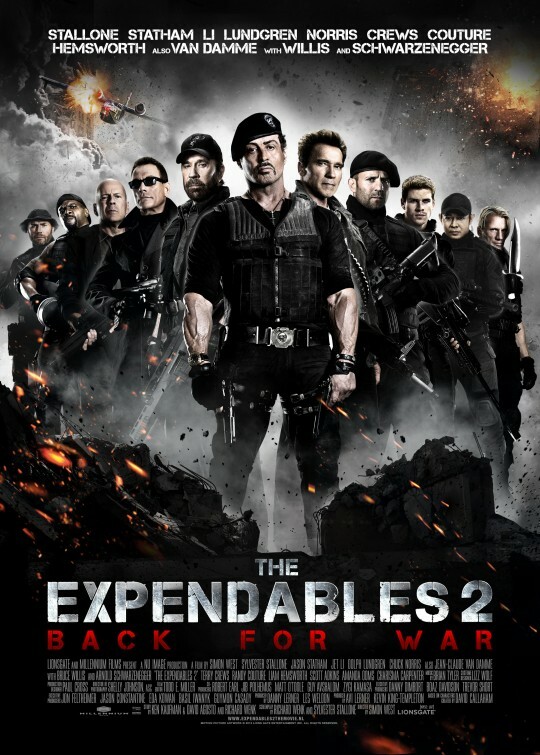 Is a viewing of The Expendables 2 worth it? I’d say if you’ve seen the original then you should try this one out because it’s better and much more entertaining. Also, if you remember the days of sleepovers with Van Damme films and Sega Genesis this is the movie for you. All others are best advised to see if their nostalgia factor can sustain two hours of grunting men and fake-looking violence.